Samsung UE55ES8000 review | What Hi-Fi? In some ways, watching this TV is better than being Harrison Ford in Blade Runner – Deckard may have been able to control his TV simply by muttering indistinctly at it, but his TV was quite obviously a CRT. A little one, at that. The Samsung UE55ES8000 is much bigger and far flatter – and, as long as you speak distinctly and don’t mumble, you can control it by speaking to it. And that’s not even the Samsung’s party-piece. Well, not its only party-piece, anyway. But we’re getting ahead of ourselves. First things first: this is a handsome TV. There aren’t many things people will pay more for to receive less of, but the bezel around a flatscreen TV is one of them. It’s pretty tricky for a manufacturer to develop a coherent design language for its TVs when all anyone wants is less of everything that isn’t screen, but Samsung has plenty of experience when it comes to turning out an attractive, distinctive flatscreen – and, true to form, the Samsung ES8000 is a bit of a looker. Admittedly that’s primarily because of its minimal bezel and correspondingly brief depth, but the complex stand is a nice flourish. By way of contrast, the specification is exhaustively comprehensive. This is, naturally, a 3D television, and one that’s equipped with three tuners (analogue for old times’ sake, Freeview HD and Freesat). The socket set is extensive: four HDMI inputs, a couple of USB sockets (able to play a range of audio and video files, and also able to record from any of the TV tuners), a LAN port for connecting to your network (the Samsung does, of course, have integrated wi-fi too) and a 15-pin PC input. Hidden under a sticker on the back of the screen is an ‘expansion port’ which will, says Samsung, allow your 2012 screen to be upgraded to 2013 specification via a plug-in board if it turns out 2013’s Samsung TVs are notably better specified than this year’s model. Consider the ES8000’s dual-core processor. Add in what can confidently be described as ‘a stack’ of Smart TV online functionality, and a pair of remote controls (one a fairly standard all-functions wand, the other a far swisher affair with a nicely responsive touchpad). Ponder the ability to control the TV using gesture or voice (via the mic and camera housed in that little bulge on top of the screen that mirrors the manufacturer’s logo on the bottom), and you’ll concede that the UE55ES800 is, as they like to say in the motor trade, fully loaded. As usual, the Samsung’s on-screen menus are a paragon of logic and legibility. This is a friendly screen to set up, in as much as basic adjustments are straightforward to make – it doesn’t take an expert to get the ES8000 delivering pleasing pictures. The more confident, though, who like to delve a little deeper into their TV’s configuration, will find plenty of scope for finessing of colour balance, motion processing and so on. This isn’t an intimidating device in any respect, however, and it doesn’t demand you spend half a day in front of it with the manual to hand before you can enjoy it. Equally important to the ergonomic experience is the remote control – and both of the Samsung’s are useful. The more straightforward handset has a button for every occasion, and it’s possible to exploit pretty much every aspect of the ES8000’s performance with this remote alone. The ritzier Smart Touch Control features a touchpad for scrolling through menus in a computer-mouse fashion, and features shortcuts to specific menu areas, as well as a list of recently used functions for swift access. All of this is useful, if not essential – but the Smart Touch Control also features a mic and button for accessing the voice control functions. It goes without saying that the mic integrated into the bezel will have trouble hearing you if the TV’s actually working, but by speaking into the remote you can vocally interact with the 8000 without having to yell. The vocabulary of the voice-recognition software onboard the Samsung is remarkably sophisticated – we fully expected the TV to respond to vocal prompts like ‘volume up’, ‘web browser’ and so on, but its ability to correctly identify ‘civil war in Syria’ when we wanted to conduct a Google search is pretty impressive. Once you’re over the initial weirdness and self-consciousness of verbalising your interaction with your TV, it’s generally a fairly swift and painless way to navigate around the ES8000’s many functions – even if having to repeat ‘volume up’ every time you need to make an incremental increase in volume is a bit of a faff. The gesture recognition is, in fairness, a less successful way to operate the Samsung. The self-consciousness thing is even more strongly in play here, and the ES8000 is less sure of itself when it comes to recognising gestures than it is voices. Until the software is capable of differentiating between a circular wave and a side-to-side wave with consistency (and that day is most certainly coming), we’d stick to operating the TV via a combination of voice and touchpad. After a few hours it’s an entirely intuitive way of navigating. There’s also something Samsung is calling an ‘IR blaster’ include among the ES8000’s many accessories. This enables any devices connected to the TV – set-top box, maybe, or Blu-ray player – to be operated via voice- or gesture-recognition too. Never let it be said that this isn’t a thoroughly specified product. This level of interactivity is all well and good, of course (and as an indicator of the way the TV market is heading it’s a clear signpost), but it’s far from the be-all and end-all: if a TV doesn’t perform its primary functions adequately, all the ergonomic sophistication in the world won’t prevent it from being an also-ran. So it’s a pleasure to report the UE55ES8000 is never less than competent and, more often, quite outstanding when it comes to picture quality. There’s certainly nothing to complain about where native high-definition 1080p images are concerned. A Blu-ray copy of Clint Eastwood’s strangely sentimental The Hereafter looks positively lustrous, with beautifully deep and detailed black tones coexisting happily with bright, clean and equally detailed whites – contrast is strong. This is, in part, due to the Samsung’s dual-core configuration – there’s sufficient processing power on board to allow very specifically targeted micro-dimming of the screen’s backlighting even though backlighting LEDs are arrayed only along the vertical sides of the screen. Skin tones and skin textures are equally impressive, being convincingly realistic and lifelike. There’s a degree of detail on display that lays every pockmark, every broken blood-vessel and every other blemish bare. This wide-ranging tonal and textural variance is a product of the extensive colour palette, which allows every scene to be coloured entirely persuasively. The edges the Samsung draws are smooth, too, even when motion is at its most testing – the ES8000’s motion processing is exemplary. Or, to be strictly accurate, it’s exemplary once you’ve spent a little trial-and-error time in the ‘advanced’ section of the set-up menus. 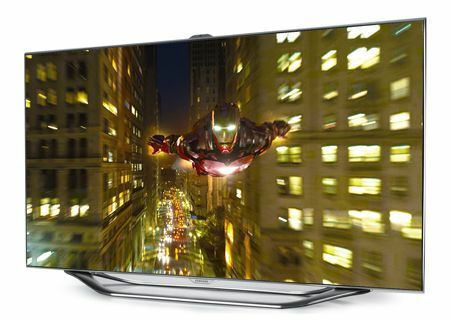 Switch up to 3D Blu-ray (in this instance the dull but visually sumptuous Sanctum) and it’s immediately apparent that Samsung has made significant strides over its 2011 range of TVs. These are the brightest 3D images we’ve seen from a TV so far – even the subterranean scenes enjoy plenty of low-light detail. Overall detail levels are dizzyingly high by prevailing 3D standards, picture-noise is notable by its absence and Samsung has suppressed cross-talk pretty well. Motion, again, is dealt with relatively confidently, and the stability of the ES8000’s 3D images makes the viewing experience far less tiring than from any of the company’s previous offerings. At this point it’s probably pertinent to mention the ES8000’s 3D glasses. The price includes two pairs and, by the standards of active-shutter, powered 3D glasses, they’re gratifyingly light and slender (although the battery compartment in the bridge of the nose is fairly flimsy). Part of their airy appeal is undermined somewhat by the amount of light that is allowed in from the side of the frame, but if that’s the trade-off for not having to wear a big, heavy pair of bins that could easily double as blinkers, well, we’ll take it. Even playing 3D console games is a far less stressful exercise than would have been possible from any 2011 3D TV. Veteran favourite Wipeout HD 3D on Sony’s PS3 is as hectic as ever, the screen busy with information, but such is the 3D facility the Samsung demonstrates that it’s possible to play for quite a while before fatigue sets in. Which, given what an intense game Wipeout is to play even in 2D, is saying something. In any event, the ES8000 is a very worthy gamer’s TV. Even though ‘game’ mode is hidden away in some unlikely corner of the set-up menus, and even though the ‘game’ mode defeats the majority of the lag-inducing motion processing protocols, the Samsung deals with rapid motion well and responds to a player’s commands with alacrity. It’s worth noting that games aren’t immune to some picture noise and flaring in extremis, but the overall experience is high-contrast, colourful and gratifyingly stable. It’s a measure of just how capable the Samsung is that while DVD upscaling is where it’s at its least effective, its pictures are still eminently watchable. A DVD copy of Crazy Heart revels in the same far-ranging colour palette, strong contrasts and secure motion-tracking as its Blu-ray counterpart, but there’s some picture noise introduced along with a little softness and a drop-off in fine detail levels. On balance, we’d be inclined to leave upscaling duties to your disc-player (we found our Panasonic DMP-BDT310 gave slightly crisper, slightly more detailed results compared to the ES8000), but the Samsung’s a solid performer nonetheless. We need attach no such caveats to the performance served up by the Samsung’s TV tuners. Admittedly the pictures delivered by the analogue tuner are useful only to remind you how unmourned analogue broadcasts will be when they finally bite the dust this year, but the Freeview HD and, to an even greater extent, the Freesat tuners generate stable, colourful and detailed images. We’d probably pay the one-off price of having a dish installed in order to enjoy the additional black-tone fidelity of the Freesat tuner, but either way the Samsung’s able to give any set-top box you care to name a run for its money. As a pure television, the ES8000 is as good as any flatscreen we’ve seen. Any discussion of the Samsung’s Smart TV capability needs to start with the startling level of picture quality it is able to wring from the most marginal of sources. It’s one thing to make the likes of the BBC’s iPlayer, with its 1280 x 720 resolution, look clean, shiny and secure; it’s quite another to scrub the frankly hopeless quality of YouTube (accessed via the 8000’s bright, clear web browser) up to something that’s watchable even on a 55in TV. Clean, unblocky and relative stable with motion, the Samsung’s far and away the best TV we’ve ever seen when it comes to tarting up inferior quality video content. Elsewhere, the Smart TV content is a mixture of the entirely predictable (iPlayer, Netflix, LoveFilm, Facebook, Twitter) and the more thoughtful and bespoke. Family Story, for example, allows you to establish a private network with other Smart device users for painless sharing of photos and so on; Fitness allows you to record your progress on a number of fitness-related apps in terms of time spent, calories burned and what-have-you – there are videos of exercises for you to follow if you’re feeling up to it, and the Samsung’s high-quality camera allows you to see yourself alongside the fiddle-fit instructor (ostensibly this is to make sure your posture and movements match those of the instructor, though the easily discouraged will likely dwell on the gulf between the body of a front-room exerciser and that of the on-screen fitness coach). There’s also a Kids section, which strikes a nice balance between entertainment and education – and it’s possible to reward good work, behaviour and the like with virtual stickers in a virtual sticker book. As any parent knows, there’s little the under-10s won’t do if there’s a sticker in it for them. And while Skype is hardly a ground-breaking feature, the quality of the ES8000’s camera (shown below) means you might want to check your appearance for a moment before making any video calls. You won’t be staggered to learn that the ES8000 (which is, let’s not forget, a slice of plastic and glass which is, at just 3cm deep, shaped like a gigantic credit card) struggles somewhat to produce any meaningful sound below the bottom of the midrange. This is far from unusual where flatscreens are concerned, and the Samsung at least has the decency to avoid any overt harshness at the top end. Nevertheless, there’s still a big gulf between how thrilling the picture quality can be and how humdrum the sound is. If you can’t countenance a full surround-sound system, the least you should consider is a soundbar. Buying the UE55ES8000 and then relying on its speakers isn’t a course of action we can completely get behind. It should be apparent by now that the Samsung UE55ES8000 is a thoroughly (no, make that exhaustively) specified device. It’s got some novelty value in its many and various control interfaces, and it’s got some diverting and worthwhile online functionality too. Above all, though, it’s got an abundance of talent where picture-making is concerned, and that has to be at the heart of any television. In purely performance terms, the ES8000s is well worth its five stars – everything else is, basically, jam on it.